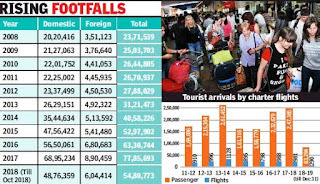 Though tourism stakeholders have called the current season an unusually poor one in terms of tourist arrivals, the Economic Survey for 2018-19 said there has been an 4.69% increase in the total arrivals compared to last year. The conclusion for this season has been drawn using figures up to October 2018, till which time 54.8 lakh tourists had visited Goa. 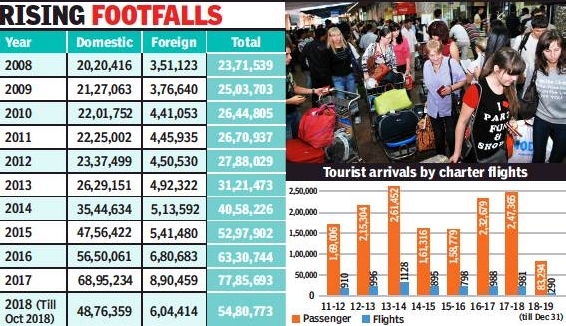 Of the 54.8 lakh, six lakh are foreign tourists, while the remaining 48.7 lakh are domestic visitors. The survey calls the growth of tourist arrivals ‘huge’ with the numbers nearly tripling over the last decade. The number of charter flights and passengers coming into the state, however, did not grow at the same rate. It peaked in 2013-14 and has declined ever since. “In 2013-14, the highest number of charted flights landed (1,128) in the state with highest number of passengers compared to any other year (2,61,452). During 2018-19, up to December 2018, 290 chartered flights arrived with 83,294 passengers,” reads the survey. The figure for 2018-19 is with a few weeks to go for the charter tourist season to end. In comparison, in 2017-18, 981 flights arrived throughout the year with 2,47,365 passengers. Tourism trade activities continued to grow, with as many as 1,363 new hotels registered from April to December 2018. Another 6,033 new tourist taxis registered, 343 new government shacks and six private ones, 1,002 water-sports operators, and 139 new tour agencies registered.